D Casadei – 3 wine estates linked by a common approach, environmentally friendly, high density planting and low yielding vines and use of natural methods in the vineyard and the winery! We met Anna who owns the wineries with her husband Stefano in Castello del Trebbio located North-East of Firenze in the Chianti Rufina area. Across their 3 estates (2 in Tuscany and another in Sardinia) they utilise the Biointegrale approach where nature and viticulture work hand in hand. All 3 estates work organically and there is no mechanical interference as horses work the land. In the cellar, as the grapes arrive in a very healthy state, minimum sulphur additions are neccesary. All yeasts are native and they use a mixture of amphorae, steel and wood for fermentation and ageing. Based near Firenze, the estate is made up of vines, olives and other agricultural production. The estate has mainly Sangiovese with some Canaiolo and Ciliegiolo for the Chianti production as well as Riesling, Trebbiano, Pinot Grigio and some international grape varieties for IGT wines. This estate is located in the Maremma and grows international varieties only including Merlot, Cabernet Sauvignon and Franc, Syrah, Grenache and Petit Verdot. The wines are fermented in a mixture of steel and amphorae with ageing in French oak. This was the first estate in the group to adopt the Biointegrale philosophy. Sardinia’s arid climate makes for a great environment to work close to nature and only local grape varieties are grown here including Vermentino, Cannonau, Bovale and Carignano. The 19hA of vines located some 60Km north of Cagliari are organically certified and worked by the 2 draught horses on the estate. The range we have chosen is starting to make it’s way into quality independent wines shops such as Baggot St. Wines and Clontarf Wines and hopefully soon onto some Italian restaurant lists too! 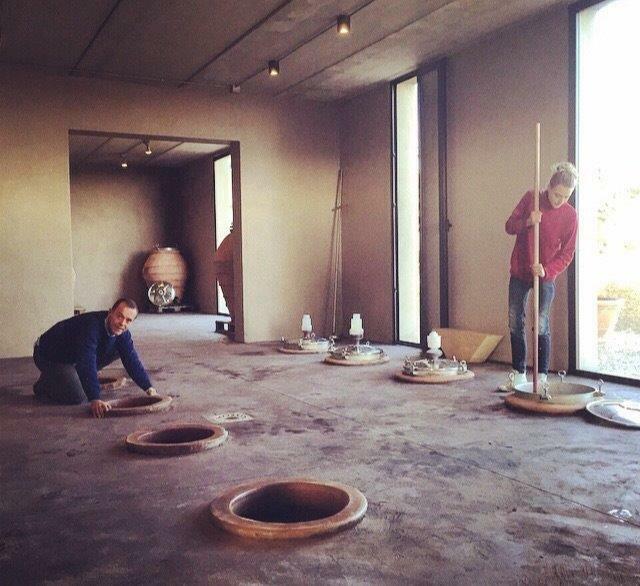 On a recent visit to Italy, we visited Luigi Valori’s vineyard in Abruzzo as renovations are ongoing. 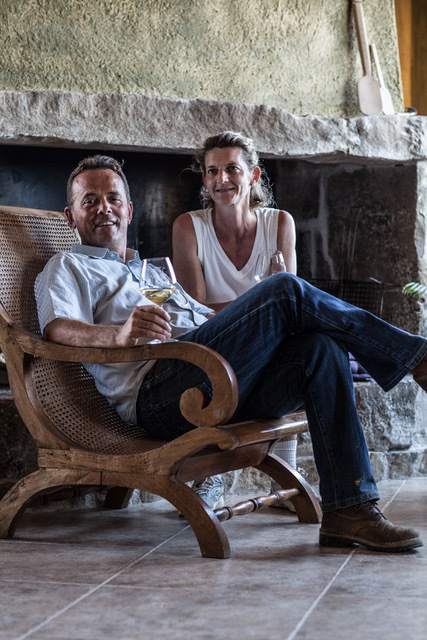 Luigi is one of those wine producers who lights up a room with his beaming smile and energetic presence, and although its been a few years since he visited Ireland, people still say ‘Ahh Luigi, how is he?’ with a smile in their voice. Luigi has had many careers over the years (including a spell as a Serie A soccer player! ), but there is no doubt that he has found a true vocation in wine production in the heart of Colline Teramane in Abruzzo, with a focus on quality and indigenous grape varieties. 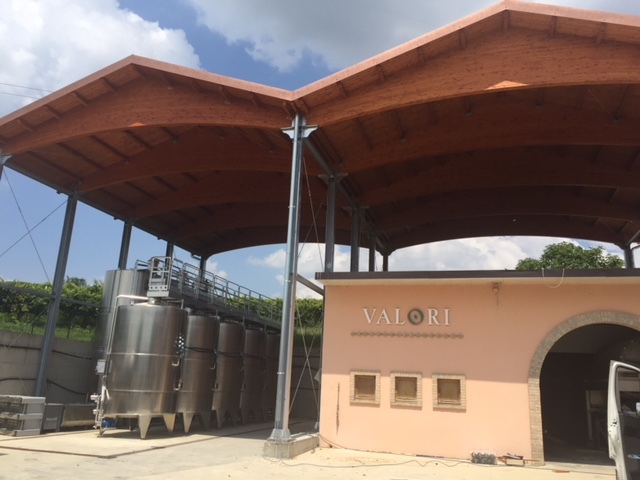 Valori Wines are organically certified since 2013, at the end of a five year conversion process, heavy on paperwork, time and money. 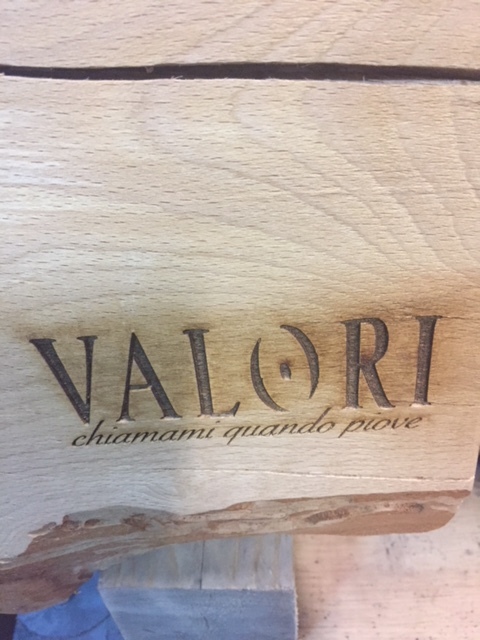 Valori wines are produced only from grapes grown on his own property, with 6 different wines produced, two white, one rose and three reds. The whites are made from 100% Trebbiano d’Abruzzo, which is a far cry from the insipid Trebbiano wines available in most winebars! Its got citrus, ripe white peach and tropical fruit with just enough minerality to balance the fruits. His second white is made from the revived grape variety Abruzzo Pecorino, again with lively minerality, more stone fruits on the palate. Cerasuolo is the Rose in the range, fresh yet rich wine made from Montepulciano d’Abruzzo grapes, perfect as a summer aperitivo or as an alternative to red wine in warm weather. Red wines are mainly produced from Montepulciano d’Abruzzo, which Luigi produces from low-yield vines, thus concentrating the flavours, the current vintage is smooth and full bodied with red fruit flavours and also deeper blackberry notes. The Vigna Sant’Angelo is a reserva, made with single vineyard Montepulciano grapes, with lots of plum and dark berry fruit flavours with a long long finish – truly a Vino da Meditazione (a wine for meditation). The last of Luigi’s wine range is a dark and inky Merlot called Inkostro (only available by pre-order and a long waiting time!). 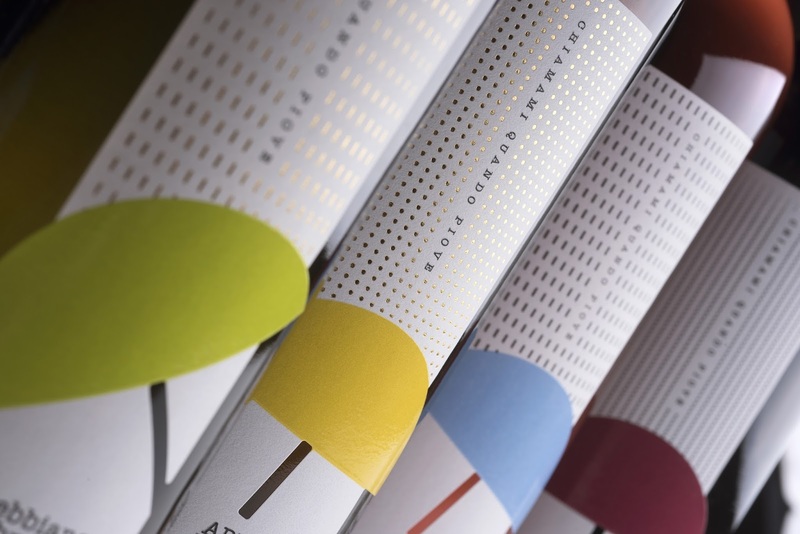 And the quote “Chiamami quando piove” – translates into ‘Only call me when it Rains’ which shows the deep link between Luigi, nature and wine, and was the frequent refrain from Luigi when his graphic designer was trying to get Luigi to meet with him to finalise the ideas for the new labels… finally he came up with the idea of the umbrellas to signify that rain is also part of the natural cycle with sunshine to produce wine! 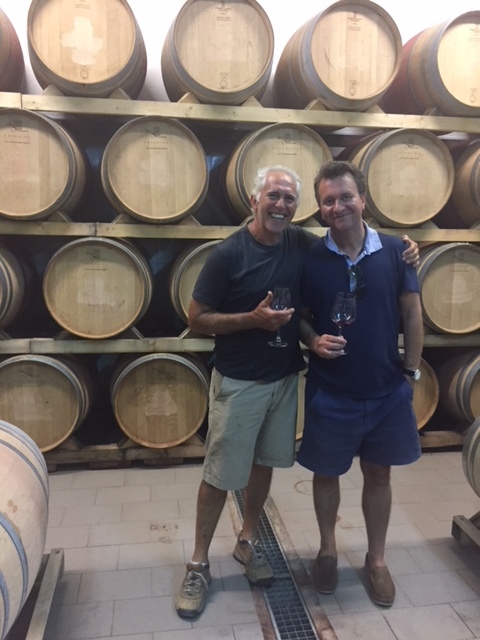 The picture shows Luigi with Colm on the recent visit to Valori Cellars in Sant’Omero Teramo Province, Abruzzo. Honest2Goodness Wines are delighted to be welcoming Antonio Benanti to Dublin later this month. We import all the Benanti wines into Ireland, subject to availability. Last September saw us visiting the Benanti Winery on the volcanic slopes of Mount Etna on a dull and rainy day, where Agatino Failla and Antonio Benanti gave us an insight into their philosophy and wine-making. As we slid along the wet stony soil, it was immediately apparent that the soil composition and the altitude and slopes play a critical part in the vineyards. Gnarled old vines and stone walls support each other in the misty rain, as Agatino tells us that there are over 70 different minerals in the soil, which explains the wonderful minerality in the wines…and the altitude prevents the grapes from becoming over-ripe. Back in the winery, still very damp from our guided tour of the vineyard outside, Antonio Benanti brings us through a guided tasting of the wines, including some back vintages, showing the wonderful ageing potential of the white wines.The keyword is quality which shines through in everything that Benanti set out to achieve. Pietra Marina Bianco Superiore: Ian D’Agata, in Decanter Jan 2015 opens his review with these remarks: …many experts consider Pietra Marina to be Italy’s best white wine… his description reads … not unlike a dry Riesling… yellow flowers, flinty minerals, dried herbs, fresh citrus and diesel fuel… this wine is made from the Carricante grape variety and it has lots of ageing potential. Antonio Benanti will be in Ireland from Wednesday 17th of May til Sunday 21st. Highlights of his visit are a 7 course WineMakers Dinner at 64 Wines in Glasthule (Wed 17th May) and an instore tasting in Terroirs in Donnybrook all day Sat 20th May.